Not only that but investors, markets and governments are increasingly using GRI data to inform investment and policy decisions – a trend expected to drive both the uptake and quality of sustainability reporting by organizations, across all countries and sectors. “Looking back to the goals we set for the original guidelines in March 1999 – to elevate and standardize sustainability reporting globally - we have come a long way. Today, sustainability reporting has entered the mainstream of global commerce and is considered a business necessity. Boards, chief finance officers and investors alike are taking notice and making ESG an integral part of their decision making. “As global society evolves so do expectations of good corporate behavior. Twenty years on from our first draft guidelines, it’s essential we keep up with these changes, ensuring we have the most effective and comprehensive framework for sustainability reporting. That is why the GRI Standards allow us to incorporate the most current thinking and set the bar across themes as diverse as occupational health and safety, human rights and water stewardship. For example, we are now working to establish a first global standard for reporting corporate taxation. GRI is the independent international organization that helps businesses, governments and other organizations understand and communicate their sustainability impacts. View more on the history of GRI and the GRI Standards. 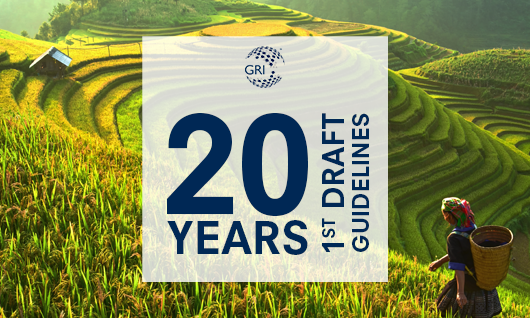 The public comment period seeking views on the first draft version of the GRI guidelines (G1) was launched in March 1999. The latest KPMG Survey of Corporate Responsibility Reporting (2017) found that, of those companies reporting on ESG performance, GRI’s framework is the most widely used. The public comment period for a new standard on taxes and payments to governments closed on 15 March. Plans for the standard will now be progressed by an independent, multi-stakeholder expert committee.